Cho La Pass Trek demands the high adventure spirit to cross the Everest Cho La Pass and reach the base of Mt. Everest. It is less trafficked trekking trail in the Everest region, but it offers the sublime panoramas of the Everest Himalayan vistas, Lakes, glaciers and the remarkable Sherpa valleys. You get wonderful hospitality of the local people during the Everest Base Camp Trekking via Gokyo Cho La Pass. The strenuous Cho La Pass Trek requires a perfect physical fitness and acclimatization. Lukla is the trekking starting point. In order to reach at Lukla, you need to have a short flight to there from Kathmandu. Namche Bazaar is also the wonderful place. Gokyo Valley is the high altitude located in the Sherpa valley, beside the blue Lake. Trekkers feel it as the new universe and the dazzling panoramas. For more acclimatization, you hike to Gokyo RI and view the Everest five Lakes and glaciers. The views of Everest, Lhotse, Makalu, Nuuptse and other mountains make your trek incredible. The trek to Dzongla is considered as the adventurous walking because you are going to walk on the slippery, icy and rocky trail by crossing the Cho La Pass. Then you trek through the traditional route to Gorakshep and continue to Everest Base Camp. Similarly, the hike to Kalapatthar is also adventurous, but is a popular view point for looking the astonishing sunrise over the Himalayan ranges. Then, following the usual route, you trek down to Lukla via Tengboche Monastery, enjoying the unique views of flora and fauna. For the expert leadership to the Cho La Pass Trek, Rising Adventure Pvt. Ltd. makes a perfect arrangement. 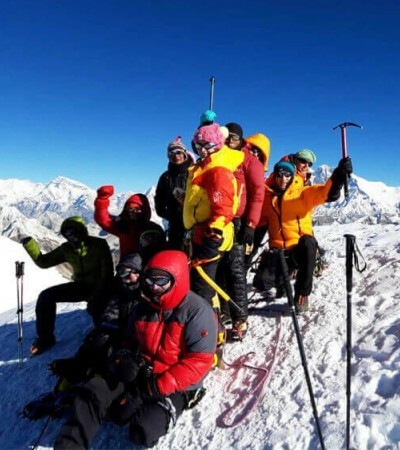 You get the advantages of the experienced Himalayan guides of this company. Please, contact us for more details.